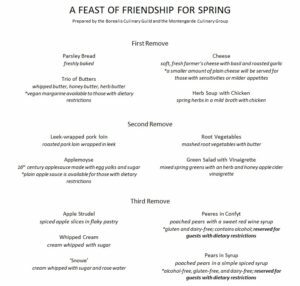 A few months ago, the event steward for Spring Grand TUA (The University of Avacal) approached us about getting together with the Borealis Culinary Guild to make a meal for the event. Happily, the Borealis Guild agreed to work with us. We set about designing a menu which would appeal to the many different tastes and dietary requirements of the populace of Avacal. 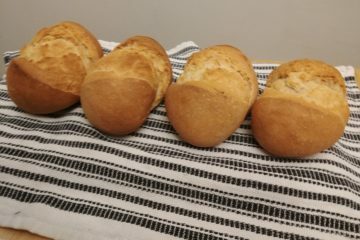 The Montengarde Culinary Group isn’t a feast-based group – although some of us have feast experience, we don’t tend to involve ourselves too much in preparing feasts for events. We’ve done appetizer platters at a small local event (Beltane) and we’ve done a bespoke feast for a small group (the Feast of St. Cecilia,) but this was our first time taking on an actual feast from start to finish. We had a few issues right out of the gate – first, most of our members weren’t available to help out with food prep or assist in the kitchen at the actual event. It’s a really busy time of year. Because Grand TUA is such a huge deal for the A&S community, lots of folks also had commitments to teach or take classes at the event. In the end, we wound up with a core team of three – Ása, Audrey, and myself – who took responsibility on behalf of the group. Our second problem was that we’d never had to work with another culinary group before. The Borealis Culinary Group has been around for over a decade, and has dozens of feasts under their collective belt. Many of its members are Pelicans and have worlds more experience than we do! We had our own ideas around how to go about planning a feast and preparing, and they had theirs. Harder still, Borealis is around three hours away, which meant that we were operating primarily over Facebook. They were extremely patient with us while we tried to figure out what to do and when. 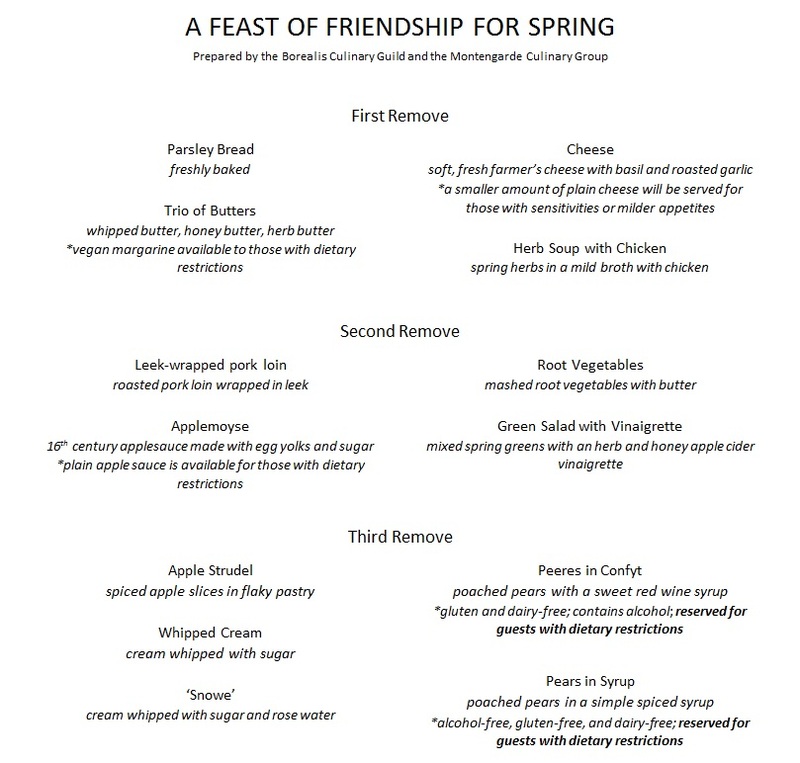 Our third problem was the number of dietary restrictions and requirements which came out of our feast pre-registration. 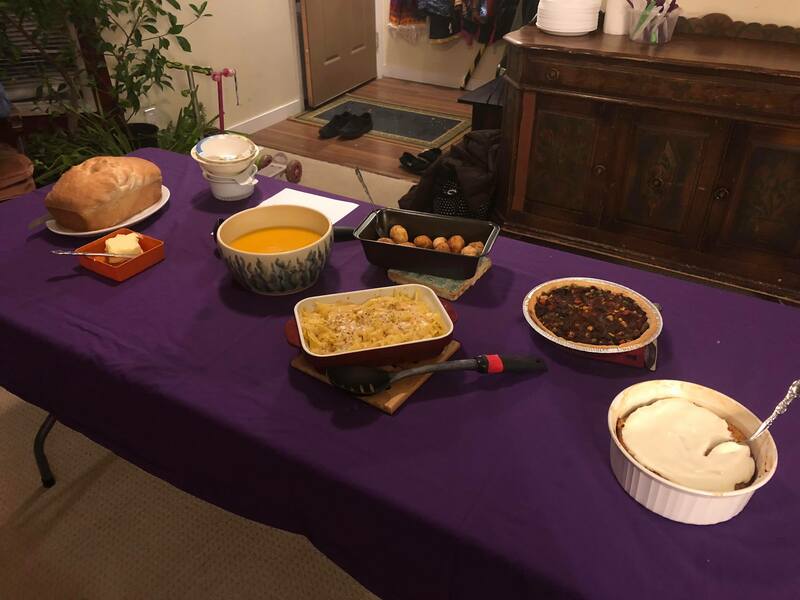 As we mostly just cook for our own small group here in Montengarde, it was surprising to see how many folks couldn’t have alcohol, gluten, eggs, pork, or dairy. 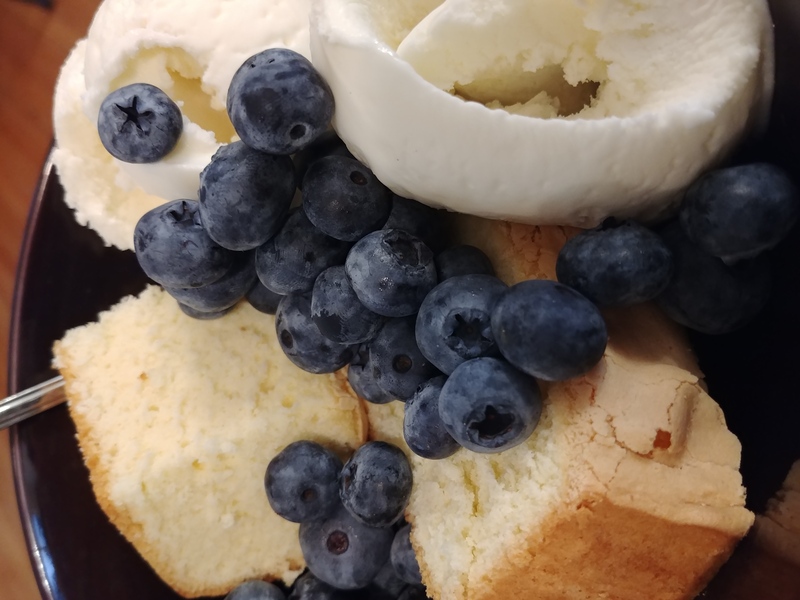 There were also a much wider range of tastes to account for, since not everyone in Avacal is as interested in reproducing period flavors as we are! It was a steep learning curve, and led to a lot of frustration when we realized that we couldn’t cook something which would be perfect for everyone. We did learn a lot about how to adapt recipes and make changes where we can to be as inclusive as possible, though! In the end, we put together a really wonderful menu and divided the dishes between Borealis and Montengarde – we were responsible for a trio of butters (herb, honey, and whipped,) a green salad with a vinaigrette, applemoyse for the pork, ‘snowe’ cream and whipped cream for dessert, poached pears in red wine for our gluten-free guests, and some poached in simple syrup for those who couldn’t have gluten or alcohol. There was a massive amount of help serving, cleaning up, washing, prepping, and even just some company to keep us sane during the day. It was really amazing to see how enthusiastic the general populace is about getting involved in feast!